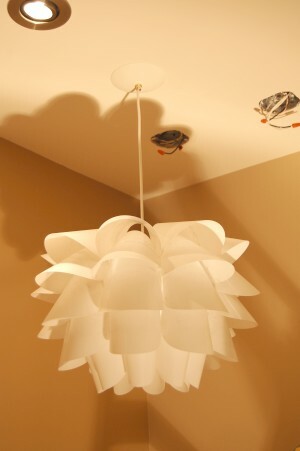 Knappa light fixture installed as a pendant light. I am inspired by lighting that echoes the forms of nature: flowers and strange undersea creature shapes are favourites of mine. For my recent living room renovation, I wanted to add a touch of prettiness to an otherwise rocky and earthen set of shapes. Ikea’s Knappa was a natural choice for me because it was floral without being too traditional. Don’t get me wrong, I love Art Nouveau, but it just wouldn’t work in the room. The basic principle is a simple one: convert a plug-in lamp to a hard-wired one. The fun part comes when you combine multiple copies of the same shape for more drama! We have a small room and wanted to keep things simple, and Knappa is a large lamp (about 18” in diameter), so we used three of them to fill the space without overcrowding. Before we started the actual conversion, I spent several weeks figuring out the exact placement of the lamps – when you’re making a permanent installation, it has to be right. I inserted eyehole screws into the ceiling, tied the lamps in place, and repositioned as needed until I got the right effect. The important part is to make sure you write down the exact position of each lamp in the ceiling (relative to each wall), so you can recreate the correct position. You also need to make sure you record the right cord length for each light. Our renovation included the removal of the ceiling and the installation of new circuits and octagon boxes for the lights, so we could achieve an effect we loved, but you can change any ceiling-mounted light for a Knappa. A special safety note: electricity can be very dangerous. Please ensure that you cut the power to the fixture before you touch it, and make sure everyone with access to the circuit panel knows that the power is cut because you’re working. Here’s how we converted each of the Knappas into hardwired lights. Parts: Knappa lamp, anti-oxidant wire paste, 2 wire connection caps, fixture cover kit (cover, threaded bolt, supporting cross-piece), or use the existing ceiling fixture parts. Optional: paint matching your ceiling colour. Please don’t forget – the power to the fixture must be off for all steps going forward! If you’re working on this in the evening, you may need light coming from another circuit (that’s what we used). If all the lights in the room are on one circuit, you’ll have to work by daylight. If you don’t want to reuse the old light, cut the cord in the old fixture and remove using the wire cutters. Unscrew the fixture cover from the ceiling and put aside. Unscrew the threaded bolt from the fixture cross piece. Remove the cross piece using the screw driver – don’t lose any of these parts! You now need to separate the wires from the circuit from the wires for the light. Untwist them if possible – you can cut these if you need to, but try to preserve as much of the circuit wire as you can. You will now have an empty octagon box with the room’s circuit wires hanging out. 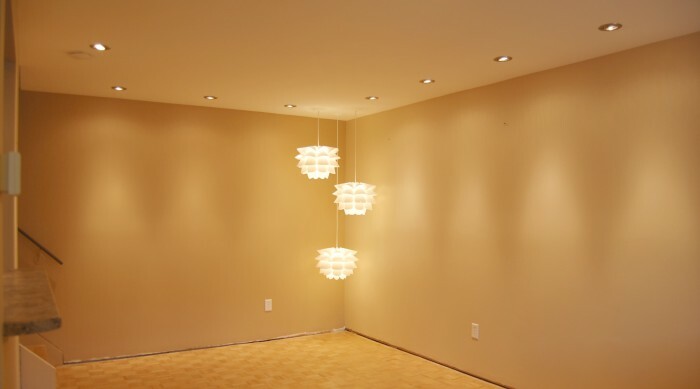 If desired, paint your fixture covers the same colour as the ceiling and allow them to dry. You could also choose a contrasting colour, but it can be disconcerting when the fixture cover almost-but-not-quite-matches the ceiling, so I do recommend painting it one way or the other. Measure out how much of the Knappa cord you wish to retain, and add 8 inches. Cut the cord using the wire cutters. Using the utility knife, carefully cut a shallow slit into the cord, and press open. You are looking for the two conducting wires within the cord, and it is vital that you do not cut their shielding. If you do, you need to start over with a new part of the cord, as open shielding is a fire hazard. Once you find the two conductive cords, you can complete the slit in the cord all the way to the cut end. Cut around the base of the cord, and remove the 8 inches of the cord housing, leaving the 2 conductive wires exposed. With the wire strippers, remove the last inch of shielding from each of the conductive wires. Twist these wires between your thumb and index finger, so that the tiny wires spiral tightly together. 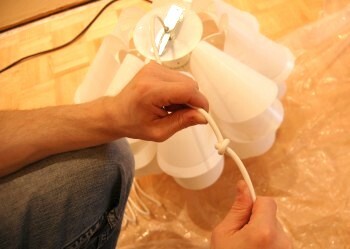 Tying a supporting knot in the light fixture cord. 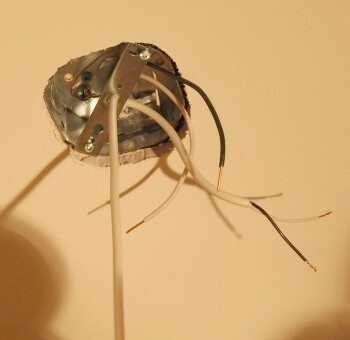 You will need to thread the ceiling fixture parts onto the Knappa cord before you connect the wires. Put the fixture cover on first (with convex side of the dome facing towards the Knappa), then the threaded bolt, then the supporting cross-piece. Tie a knot at the end of the Knappa cord, right at the base of where you removed the outer cord sheathing. This will support the weight of the Knappa – it is light, but you don’t want the weight supported by the connection of the wires for fire safety reasons. Climb up the ladder, carrying your Knappa with you. If the cord is long, you may want to have someone hold the Knappa for you, as you don’t want it bumping around and getting damaged. Twist the exposed ends of the ceiling circuit wires and the Knappa wires together: match black to black, and white to white. Light fixture supported in the octagon box. If connecting to aluminum wires, apply a generous blob of anti-oxidant paste to each of the 2 wire connections. This is a precaution against fires, as aluminum wiring especially will oxidize over time, resisting current flow and heating the wire. The paste is messy, so try not to let it get onto your hands. Screw wiring caps onto each of the wiring connections. Tuck the connections into the octagon box. Screw in the supporting cross piece into each side of the octagon box. Screw the threaded bolt into the supporting cross-piece. You can now return power to the circuit. Switch on the light and enjoy! Repeat the steps for your additional Knappas if required. Some people may notice that I have changed the shape of the Knappas themselves (very subtly). If you assemble them according to the instructions, the top row of petals sticks up too much for my taste. There are two problems: they don’t follow the angle of the petals below, and also, if you sit below them there is too much glare off the inside of the top row. To fix this, I left the top row of petals partially unpinned to the frame, so that each petal could pivot. To hold the petals at the right height (so they don’t flop completely) I used thread through the empty holes, pulled the thread tight and knotted. 3 Knappa plug in lights converted to pendant lights. You can see we still have some work to do adding baseboards! Next Post: Baseboards and other finishing touches (this is it!). How would you go about doing this the other way–converting a hard wired pendant light into one connected to a cord to plug-in? We’re renters and the room has no hard-wired ceiling lights and we’d like to create one in our daughter’s nursery. Thanks! If you need a plug-in light, why not just buy one? There are lots of options available. I think your landlord would be furious if you removed an existing hard wired light. Or, do you mean you want to know how to install a new circuit for a hard-wired light in your daughter’s bedroom? Either way, you should talk to your landlord and get their permission in writing before making changes this extensive to the space. 1. The load on the circuit is probably not going to make a difference; the load on the circuit will be the same whether you put the three lamps in one box or in three. 2. You could probably technically do it if you could find a workable and safe way of attaching the lights to the box; ie. a mounting bracket and cover style that would support all three lamps. 3. I would probably check with the electrical code rules in your area. Even if you come up with a solution that is technically safe, it may still be illegal, and may void your fire or other insurance. If you’re not totally sure in your electrical skills, as always, consult an electrician or someone who has knowledge/experience with this type of work. Thank You for posting this! We came home with the light last weekend and after we opened the box we quickly found out that we were going to need to make some adjustments! Already bought the extra things now on to tackling this project tomorrow night! Good luck- let me know how it goes! Thanks for your tutorial. I bought this light to have in my bedroom and was surprised to find a plug at the end! I’ll wire this up tomorrow. It’s the last step in my weekend bedroom redesign. I’ve already ripped out the carpet to expose hardwood, changed the bedroom furniture, installed wallpaper, new mirror, new drapes and now the finishing touch! You’re welcome – and I’d love to see some photos of your finished reno! Thanks for this information. Can you tell me where you got the cross pieces and the ceiling cap? I like the white one you show in your pictures. They all came together as part of a fixture cover kit (it included the cover, threaded bolt, and supporting cross-piece). I got mine at the Electrical and Plumbing Store in Ottawa. If you’re not in Ottawa your local lighting specialty store should have it or something similar. Good luck! the easiest way I found was to buy a 15$ pendant light kit at lowes (or home depot) – you get a white cap, cord and socket. All you do is simply install the ceiling cap in the ceiling box and from the socket side you screw on the knappa light as you would a glass lampshade pendant. Easy as 5 minutes.